Umami Burger has added a delicious new item to their menu, the Falafel Burger! Complete with a falafel patty, beet infused couscous, crushed avocado, romaine, tomato, tzatziki and pickled red onion, the Falafel Burger will be a delicious way for the typical meat lover to mix things up, or will be a new vegetarian favorite at Umami Burger in Chicago's Wicker Park neighborhood. I got to try the the Falafel Burger from Umami Burger recently. This burger is a falafel patty with beet infused couscous and crushed avocado. The falafel patty has a crisp crust and a tender center. The flavor from the couscous was on point and the creaminess of avocado complimented very well. The zingers were the tzatziki sauce and the pickled red onion rings. Both completed the falafel burger with true umami: sweet, salty, sour, and bitter. This was a vegetarian burger that delivered flavor and texture! So if you're looking for a unique and delicious vegetarian burger, THIS is it. 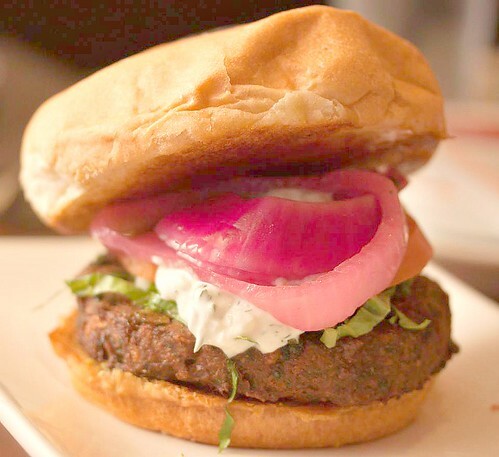 Check it out at your local Umami Burger and indulge in this meatless burger full of flavor!